What Happens to the Solar Decathlon Houses Now? So wait, these things actually can exist in the real world? Houses Without Homes was originally published on Housing Complex on Oct. 20, 2009, at 5:46 p.m. 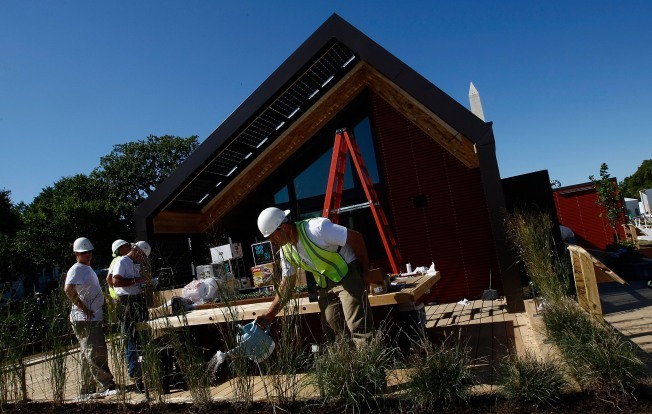 So what happens to the Solar Decathlon houses after the competition’s over? Team California’s so-called "Refract House" looks like it belongs high up in the Hollywood Hills, overlooking Los Angeles. The structure was easily one of the most gorgeous in this year’s Solar Decathlon competition, held recently on the National Mall. Shaped like a crooked U, it’s flooded with light around every corner. The exterior walls are made of iconic redwood. And the doors open onto an expansive porch with dune-like grasses around the edge. "Refract" was no cinch to build; nor was it cheap. In addition to the $100,000 given to each of the 21 contending university teams to build "houses that use innovative, high-tech elements in ingenious ways," Team California raised roughly $350,000 more to construct its house, and $1.4 million overall for other costs, including travel expenses to Washington, D.C. So it's easy to understand why after all that time and preparation -- not to mention the new nationwide "obsession" with all things green -- the house may end up not in a neighborhood near you, but on display thousands of miles away. In Santiago, Chile. Not following the logic? The Solar Decathlon is over and the teams will be facing a strange reality: After two years designing, constructing, and perfecting their homes, they must now dismantle them, and hope they’ll eventually be put back together with a worthwhile post-competition purpose. A surprisingly large number of teams contacted for this article had yet to finalize plans for their houses following the competition, which is run by the U.S. Department of Energy. And when Washington City Paper posed questions on this subject to DOE spokesperson Tom Welch, he seemed a bit befuddled by the prospect that the houses would, or should, have any sort of immediate future -- a sign that "ingenious," environmentally friendly housing is still the stuff of contests more than anything. "My honest reaction is that might be a little premature," he said. Only later did he offer a better, if blander, response about the competition's real-life impact: "These students -- it's like training a workforce," he said. "They go out and start their own businesses." It’s true, the Decathlon has given birth to five companies composed of team members from the previous three competitions, staged in 2002, 2005 and 2007, according to the event's chief coordinator and creator, Richard King. For example, students from the 2005 Cornell University team founded a green architecture firm, called ZeroEnergy Design, based in Boston. But still: What to do with this year’s houses, now? Team California has two things planned, says member Allison Kopf, 20, a student at Santa Clara University, which collaborated with California College of the Arts. First, the house likely will be reassembled in downtown San Jose, "just available for the public to go through," says Kopf. Then, after six months, it will journey to Santiago to be reinstalled at the U.S. Embassy, as an example of American innovation. Apparently, the U.S. ambassador to Chile had strolled through Team California’s 2007 Decathlon entry and wanted it erected on embassy grounds, but that didn’t work out. This time, the ambassador staked an early claim -- though nothing is set in stone yet. "We’re working on all of it," Kopf said in an interview during the competition’s final week. That line is echoed by graduate student Tim Lentz, 25, of Iowa State University, which plans to sell its house to the Iowa Department of Natural Resources. The team has an outstanding $140,000 loan, and it needs to recoup some money as part of the deal. Under that arrangement, the "Interlock House," which has plenty of ramps and was created to appeal to seniors, would be reassembled in a park near Des Moines, about 30 minutes from the school’s Ames campus. "We’re trying to keep it in the area so we can use it for research," said Lentz. This year’s Cornell team just sold its house over the weekend -- also to secure some cash to pay off debt, according King. "Cornell had it advertised on their Web site that they wanted to sell it. That’s the easiest way to raise money," he says. At least one school had the foresight to consider its house’s eventual landing spot -- with real, live inhabitants -- from the very beginning. Rice hopes eventually to build three nearly identical properties and possibly a larger house nearby, all for the Project Row Houses community, according to Allison Elliott, 21, a Rice senior. Valued at $140,000, Rice’s house was, by far, the cheapest entry -- the only one in the "up to $250,000" category. The average cost per house was $490,000, according to King. "We really wanted to show the public that solar panels and solar power would be something anyone could use -- to show people that solar is not out of their reach," says Elliott. University of Illinois at Urbana-Champaign's home was built on the design principals of a "passive house," a "very well-insulated, virtually air-tight building that is primarily heated by passive solar gain and by internal gains from people, electrical equipment, etc.," as the Passive House Institute describes the philosophy. In simpler terms: Think thick walls and well-sealed windows that trap in heat, says Tim Moran, 28, an engineering and architecture graduate school student. "Solar power is expensive; insulation is cheap," adds Moran. While developing its house, Illinois hooked up with Homeway Homes, a modular homebuilder with sales centers throughout the Midwest. Working with team members and the Passive House Institute, the company will create an inspired modular home model in the next year or so, according to Moran. As for the Decathlon house itself, Moran says it’s staying close to campus, on the grounds of a hotel inside the Research Park at the University of Illinois, where companies work on collaborative projects with students. Decathlon officials seem as if they couldn’t care less what happens to the houses, as long as they’re put to some kind of good use. "We don’t score that," says Decathlon director King.